Technology has impacted our life in many ways and GPS for dogs is the high tech way to always keep track of your Pug. How great would it be to never worry again if your Pug happens to get out of the house? 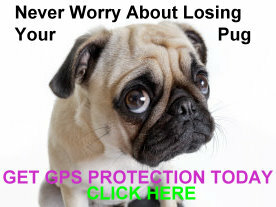 With the same technology that is used to navigate your car from one point to another, you’ll be able to locate your lost Pug quickly through a variety of tools. With the GPS for dogs that is available today you’ll be able to have a new level of security and be able to track your friend from almost anywhere through the Internet, your cell phone or Blackberry. With some of the services that are out there today you can even call a customer service center to help track down your furry little friend. As we know, Pugs are very curious little dogs and love exploring new things. Unfortunately, although they have many other admirable traits, having a good sense of direction is not one of them. They can get very lost very quickly. Your Pug is such a loyal friend and such a big part of your life, why take the chance of letting him get lost? Usually a GPS system is a one time investment with a monthly cost that provides around the clock service. No matter what time of day or night your Pug is lost, you’ll have the assistance you need to track him down. GPS for dogs isn’t cheap but, then again, neither was your Pug. You can’t put a price tag on how much love your Pug has brought into your life. You’ll be putting your mind at ease knowing you can track your little guy down no matter where he goes. Unfortunately it does not take long for a lost Pug to get into an undesirable situation. They're not going to do well against a bigger dog and, unfortunately, they usually don't know that. Sometimes they just don't know when to back down. The best approach is to avoid those possibilities altogether and be able to know your Pug's location at all times. Through the wonders of technology, now you can!